RIHE Institute Library Homepage has been renewed! We are pleased to inform you that we have redesigned our Institute Library website. We hope you like it and find it easy to use even more than before. Also, “Library Databese Search” is expected to be reconstructed soon. 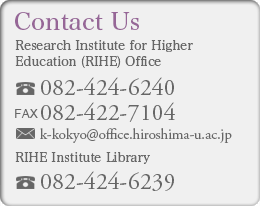 Visit RIHE Institute Liblary Homepage from here.